Barry-Wehmiller may not be a familiar name in the printing industry, but nonetheless this serial acquirer is clearly committed to the business of putting ink on paper. Behind the scenes, the company now owns many of the manufacturers that make the machines required to sheet, convert, fold, palletize, corrugate, prep for mailing, and pack paper into useful products. Embarking in 1987 on a strategy to provide manufacturing technology for the packaging, corrugating, sheeting and paper-converting industries, the privately-held US company is now a $2.8 billion global organization with 11,000 employees. 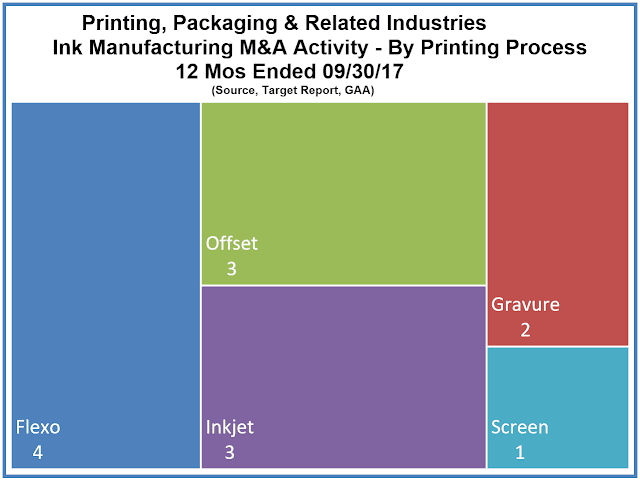 While the industry is rocked by a seemingly constant stream of game-changing consolidations (more on that next month), Barry-Wehmiller continues to rack up its own steady stream of acquisitions of print technologies and machinery, announcing in September the purchase of Graphbury Machines through its Pennsylvania-based division, Paper Converting Machine Company. The acquired company makes machines that use lasers to clean anilox rollers in flexo printing operations. BW Forsyth Partners, a partnership of Barry-Wehmiller and a team of private equity investors, announced two acquisitions, also in September, through its portfolio company Baldwin Technology. (The Baldwin name is likely much more familiar to printers who know Baldwin from its aftermarket sprayers, fountain solution circulators, UV and IR drying systems, and web process controls.) The acquisition of Ahlbrandt Systems adds web treatment equipment to its lineup, followed up by the addition of print inspection systems with the purchase of PC Industries, located in Gurnee, Illinois. 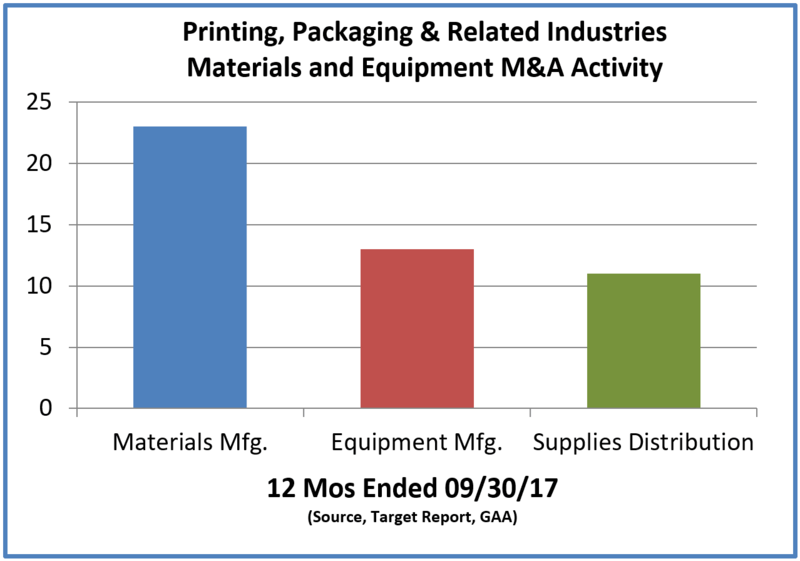 Looking back over the past twelve months, M&A activity, as reported in The Target Report, has been robust among those companies that support the printing, packaging and related industries with the equipment, materials and supplies needed every day to manufacture printed products. We noted 47 deals on the input side of the supply chain in our deal log, with the majority being manufacturers of materials. Transactions in which the acquired company was an equipment manufacturer were about even with acquisitions of distributors. 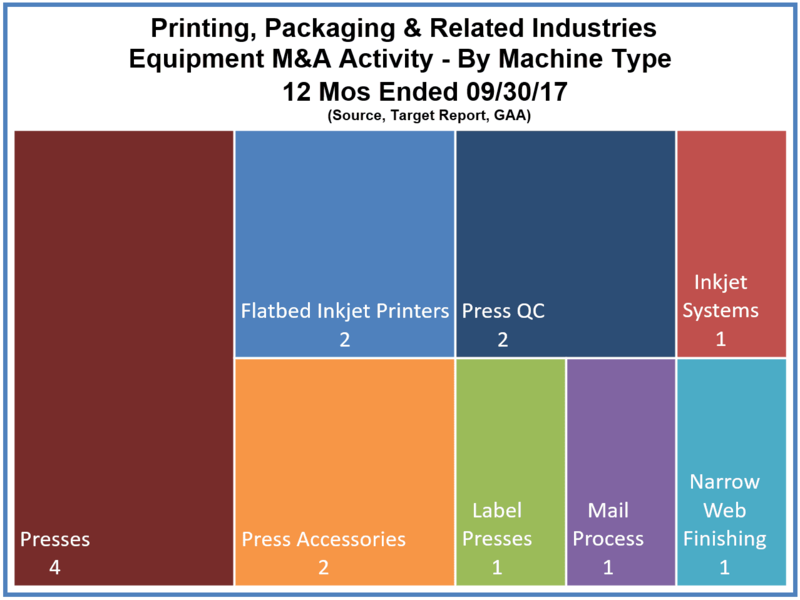 As one would expect in the printing industry, the majority of acquisitions in the equipment segment over the past twelve months are in some way related to the traditional workhorse of the industry, the printing press. Also, as the initial wave of inkjet technologies matures, makers of flatbed inkjet devices have become attractive targets. M&R Companies, a portfolio company of Corinthian Capital, expanded beyond its core competency manufacturing screen printing equipment with the purchase of Novus Imaging, the New Hampshire-based manufacturer of digital flatbed and roll-to-roll UV inkjet printers. As noted above, Barry-Wehmiller recently acquired a print quality control company. 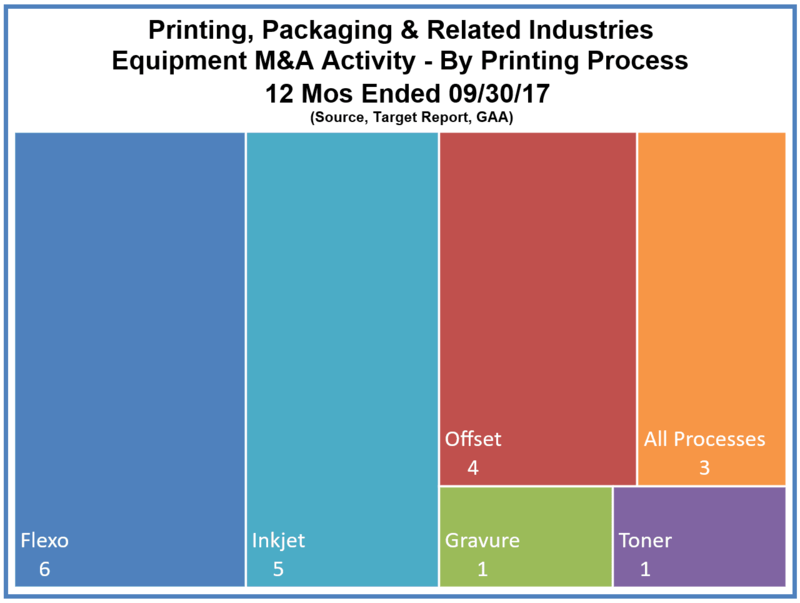 During the past year, another print quality control company, Advanced Vision Technology was purchased by another acquisition-driven private company, Danaher (see The Target Report – March 2017). Earlier this year, Barry-Wehmiller, through its Winkler + Dünnebier subsidiary, acquired Halm Industries, the maker of the ubiquitous Halm Jet Press, for decades the press used to print millions and millions of pre-converted envelopes. Altor Funds, a private equity fund based in Copenhagen, acquired the TRESU Group from another fund in a secondary buyout (for more on secondary buyouts see The Target Report – October 2016). The acquired company is a manufacturer of high performance flexographic printing presses, primarily used to print packaging. Indicative of the rise of flexographic printing as a serious contender for printing high-quality packaging, the largest number of deals involving equipment in the past year have involved flexo. 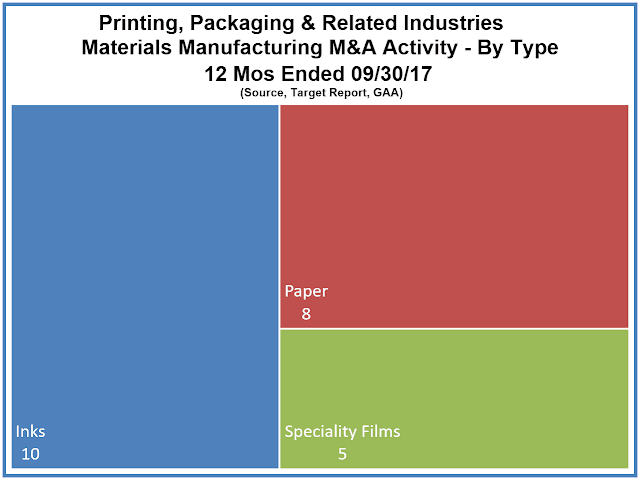 Deal activity has been robust in the materials segment, with the majority of the deals involving inks, including pigments, colorants and coatings. Large companies have repeatedly acquired small innovative companies for their specialty inks developed for specialty applications such as fabric printing, UV-cured inks, electro-conductive inks and digital printing. For example, Sun Chemical, a division of Japan-based Dainippon Ink & Chemicals, acquired RJA Dispersions, a maker of high-quality pigment dispersions used in digital printing. 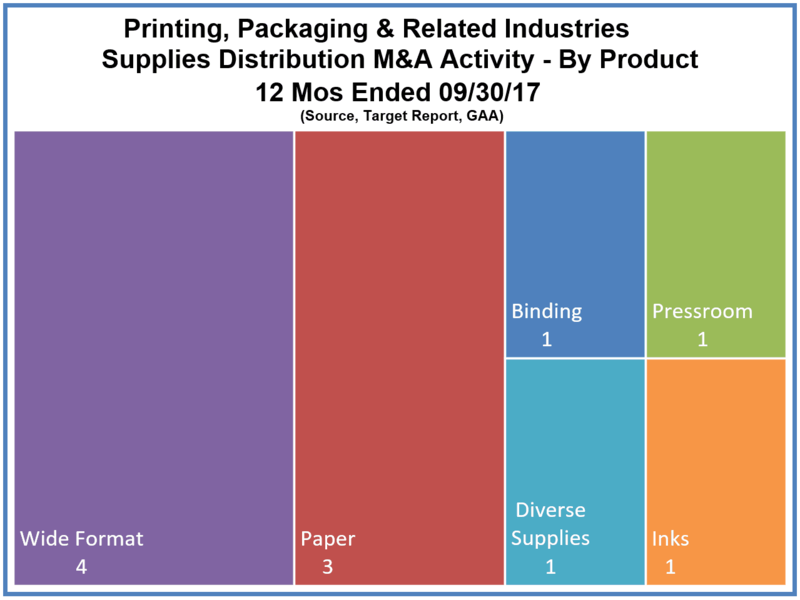 Closely behind transactions involving ink manufacturers, in terms of numbers of deals, are acquisitions of companies that manufacture papers. If we had included bankruptcies and plant closures in our counts, then paper deals would have been the majority. It’s clear that one of the primary reasons for deals in the paper manufacturing segment is shrinking demand for paper, with two more mills closing in the past year, Southworth Company in Agawam, Massachusetts and the PaperWorks mill in Philadelphia. Southworth subsequently filed Chapter 11 bankruptcy at the end of September. As with the breakdown of equipment manufacturers by printing process, when we drill down into the deals involving ink, we find that in the past twelve months the lead in terms of deal count is again the flexographic printing process. The consolidation in the paper distribution business has been at a steady drumbeat for the six years that we have been researching and writing The Target Report. * Lindenmeyr Munroe, a division of privately-held Central National Gottesman, acquired paper distributor Independent Paper Group in St. Paul, Minnesota. In keeping with the times, and the growth of wide format printing, Lindenmeyr also acquired a distributor of wide format supplies, KFI Technology based in Trenton, New Jersey. *This edition of the TR marks six years since we published the first Target Report deal log and commentary, and published every month thereafter. 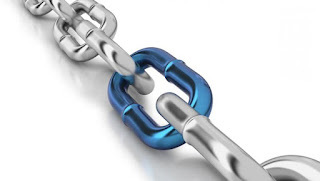 * Graphic Arts Advisors, publisher of The Target Report, in conjunction with Corporate Development Associates, served as exclusive advisors to Datatel in this transaction.